Recto: A black and white photograph within a black border showing Capt. 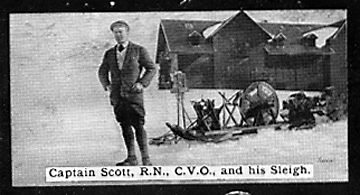 Scott in front of a "motor sleigh" (appearing to be at Fefor in Norway although this is not stated). The caption reads: Captain Scott R.N., C.V.O., and his Sleigh.